In Russian folklore, the Volga River is mother and mistress, comrade and beloved companion and subject of tall tales. For today's Russia, it remains all of the above and an important source of water, power and transport. Stretching 2,300 miles, the Volga is about the length of the Mississippi and the longest river in Europe. It rises out of swamps northwest of Moscow in the Valdai Hills. Fed along its way by lakes and smaller rivers, it expands to become the mighty Volga, wending its way through Russia's heartland and eventually flowing south to the Caspian Sea. According to a Russian proverb, the know Russia is to know the Volga. But looking at the river's slow, smooth-flowing water, it's hard to fathom what a huge burden it carries. The Volga basin makes up 8 percent of the vast Russian territory. It carves its way through European Russia, supporting more than 25 percent of the country's agriculture and industry. Some 40 percent of the country's population is concentrated within the river's vast basin. In the 16th century, forces of the grand princes of Moscow moved south from the city, conquering the long reach of the Volga, creating what is now known as Russia. Eleven of Russia's 20 largest cities had their beginnings as Volga fortresses. Through Russia's early imperial history and the rise of the Romanov czars, the river played a key role. The bloody civil war following the 1917 revolution was decided on the Volga. During World War II, 1 million Russians died defending the river. But it is now much more than just a river. It also includes a complex web of lakes, smaller rivers and manmade canals stretching from the far north to the country's southern reaches. 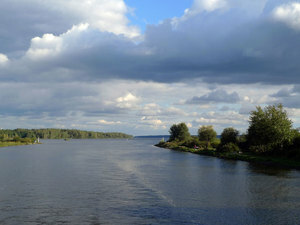 "Thanks to canals, the Volga is now the main link in a huge system which has allowed Russia to be connected to the White Sea far to the north, the Baltic Sea, the Black Sea, the Sea of Azov and the Caspian," says Rostislav Frolov, a professor at the Academy of River Transportation in the city of Nizhny Novgorod. By the 20th century, Moscow desperately needed the Volga. When Russia was still but a collection of principalities, it had been founded on the much smaller Moskva River. Then, Russia's isolation had been its strength. But the world had changed. Soviet leader Josef Stalin harnessed nature with prison labor in 1933, constructing a canal to link Moscow to the Volga 80 miles north. Unknown thousands died in the process. On a recent day, schmaltzy music accompanies a cruise ship as it pulls out of a Moscow port. But one passenger cringes, saying, "We are floating on bones." But without this canal, river expert Vladimir Debolsky says the expanding Russian capital could not have prospered. "The Moscow River, which often dried up, could not supply the capital's growing needs. Now, 90 percent of water for this city of 10 million comes from the Volga," says Debolsky, of the Institute of Water Problems, part of the Academy of Science in Moscow. "Many died building this canal. I have no love for Stalin. But there was no other way to do it, given the conditions of the time," Debolsky says. As the cruise ship moves through a wide canal into the Volga, it passes a half-drowned bell tower, where villages were flooded. And then there's the first of many reservoirs checking the river's flow south. Under Stalin, the river was also tamed to provide hydroelectric power. He pulled the river into a noose and put it to work. There are now eight vast reservoirs, among the largest in the world. The Russian flag hangs from a cruise ship traveling down the Volga River from Moscow. In winter, the Volga ices up. River transport shuts down. But until the frost forms, sailboats and speedboats ply the waters. Fishermen in more modest craft bob along the low-lying forested shore. What's not visible lately is much commercial traffic — even in what should be the busy season. For long stretches, it seems the cruise ship owns the river. Passenger and cargo transport is way down. In 1989, Russian inland river transport was 600 million tons, about equal to the U.S. It's now down to 100 million tons, according to government statistics. In the chaotic 1990s, after the collapse of the Soviet Union, ships were broken up for metal and quick cash. Efforts are being made to restore the fleet, but rebuilding what was so quickly destroyed is difficult and expensive. biologist Gennady Rozenberg, at the Russian Academy of Sciences in the Volga city of Togliatti, says the political and economic crises have brought some good news — at least for now. "There's much less industry now and pollution is therefore less," he says. "However, this improvement has nothing to do with environmental measures. Now that the government says it is going to double the GDP, we can expect a lot of new serious [pollution] problems," Rozenberg says. Without adequate study and regulation he anticipates the river's delicate system will be overwhelmed. Scientists studying the river have watched their funding drop. Debolsky, at the Institute of Water Problems, is alarmed. "I am old. After me, there is only one person left in my department. There are no young people following on. And we need time to train them," Debolsky says. Trash is the bane of the Volga shoreline. Commercial traffic has slowed and pollution has decreased in recent years but a push for more commerce has many fearing another rise in water problems. But if the fate of the river is uncertain, its place in Russia's national consciousness is assured. There isn't a Russian who doesn't know the song of the Volga boatmen and the words "Volga, Volga, you are our pride." If the Volga is to remain the nation's pride — and lifeblood — it needs care. Forests along the river are being cut, affecting runoff. Smaller rivers feeding the Volga are drying up. Like the Mississippi, there are looming problems with decreasing water levels and stagnant, tainted reservoirs. Environmental groups such as Protect the River have stepped into the breach to help with monitoring and public education. Elena Kolpakova, who heads the branch in Nizhny Novgorod, has been working on these issues since 1991. She says valuable contacts with more experienced Western organizations have been officially discouraged. Prime Minister Vladimir Putin's government has made it extremely difficult for outsiders to support and aid Russian non-governmental organizations of all types. She regrets these new complications because she says foreign groups have helped a great deal in the past. She says it's still hard to get financial support in Russia, though it's slowly improving. Green movements, evident in the U.S. and Europe, have yet to gain momentum in Russia. With the push to develop, those worried about the Volga say Russians are more concerned with other issues. The Volga also reflects Russia's patchwork of ethnic groups. Many who live along the Volga were once violently subjugated. But they are now rediscovering their roots, most noticeably in the Volga city of Kazan, where new minarets and gilt Orthodox copulas compete for prominence on the city's skyline. Half of the 1 million residents of this oil-rich city are Tatar Muslims. So far, Kazan has been an example of prosperity and peaceful co-existence. But Valiulla Yakukov, deputy mufti of the government-backed Muslim religious board of the Republic of Tatarstan, says the Muslim establishment has not responded to the interests and desires of young Muslims. He worries the extremism and violence that has torn apart other Muslim regions of Russia could erupt here. He fears that an influx of conservative ideas from abroad is beginning to undermine local traditions of tolerance and could threaten the stability of the region. "I am not an optimist," he says. The soothing sound of the river as it flows through Russia is deceptive. Along the Volga, historians fight over the country's legacy, environmentalists struggle to get people's attention, politicians vie for power and ordinary Russians ask the eternal Russian question: Where are we going?